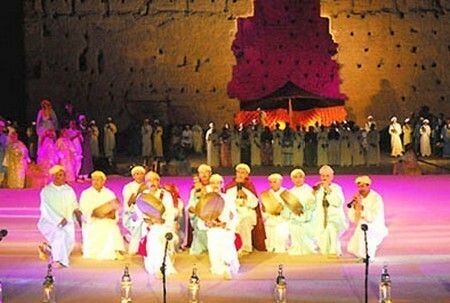 The Fes Festival of World Sacred Music will take place from May 6th – 14th this year in in the imperial city of Fes. The festival was founded in 1994 by the Moroccan scholar and philanthropist Faouzi Skali and was created to showcase major musical traditions of sacred, spiritual music and world music. The current Artistic Director is Alain Webber. Each year the Fes festival celebrates artists from Muslim, Jewish, Christian, Hindu and other faiths to perform together in a spirit of mutual respect and collaboration. A four-day Forum called Rencontres de Fes under the rubric “Giving Soul to Globalisation” where politicians, social activists, academics and religious leaders come together in dialogue to discuss the urgent issues of our times. These include conflict resolution, climate change, urban renewal, social justice and much more. Intimate afternoon concerts at the Dar Batha Museum and its surrounding Andalusian gardens. Art and film exhibitions, poetry readings at the Dar Bartha Museum and other locations within Fes. In the morning, visitors can take part in seminars or round table discussions covering topics related to the theme of the festival. By attending the discussion, you can gain extra insight into the meaning of the festival. In the afternoon, evening, and late at night, there are concerts given by performers arriving from every angle of the globe. These musicians help celebrate all the cultures and religions of the world through a multiplicity of their songs and rituals. The musical spectrum heard includes early European classical, Sufi ritual songs and trance music, Arab-Andalusian rhythms, a Bulgarian orthodox choir, Hindustani chants, Celtic sacred music, Christian Gospel, Swedish chamber choir, Pakistani Qawwali incantations, Egyptian madhi odes, flamenco-style Christian saeta, ancient Indian gwalior chants and Turkish whirling dervishes. 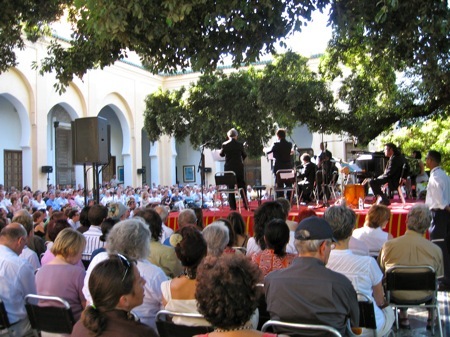 Traditionally, the festival’s most impressive afternoon concerts take place by the Dar Batha Museum, which is set amidst a beautiful Andalusian garden and has a backdrop of the Atlas Mountains. 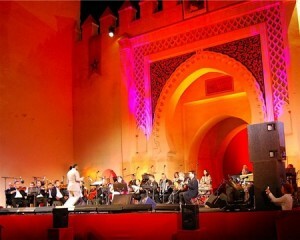 During the evening concerts are held at the Bab Makina and Palace Boujeloud. After the last concert of the night is over, the medina is the place to head for a continuation of a once in a life time experience. Every evening at midnight, there are free “Sufi Nights”. These highly popular Sufi ritual trance performances are held at the Dar Tazi Palace gardens where Sufi brotherhoods like the Hamadcha, the Aissaoua and The Master Musicians of Jajouka perform while you relax on Berber rugs and sip mint tea. Friday, May 6th: Bab Al Makina – Opening Night Premier 21h00 A Sky full of Stars: International Premiere Women of myth and poetry from Sheherazade to the Queen of Sheba With women artists from Morocco, Mongolia, Azerbaijan, Iran, Ethiopia, India, Lebanon, Italy and Africa, with an oriental orchestra. On Marrakech’s Djemaa El Fna Square amongst the orange juice stalls and story tellers you will find stalls with CD’s testifying to the popularity and importance of Morocco’s contemporary music scene which began with the accession of King Mohammed VI in 1999 when greater liberalization of musical genre especially for young people who sought music which reflected their aspirations was gradually phased in and supported with musical festivals organized with royal support and sponsorship like the annual Mazawine Music Festival in Rabat, The Gnawa Festival in Essaouria and the World Sacred Music Festival in Fez. 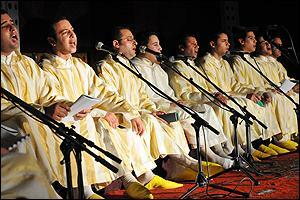 Moroccan TV and radio channels also play an important role with live performances. 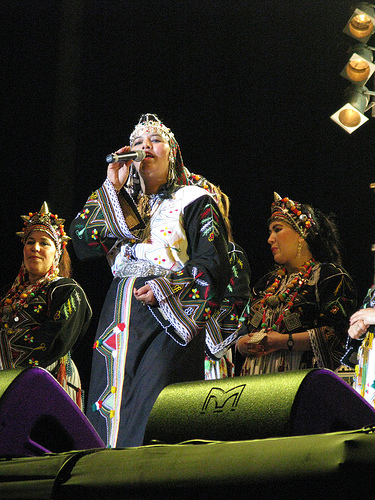 The Moroccan contemporary music scene and its festivals have successfully fused elements of its ancient Berber musical traditions with modern music such as Chaabi, Hiphop and Rai and Rap. Classical Malhum which translates as “gift” or “inspiration” is Arabic in origin and is derived from Sufi inspired Arabic Andalusian poetry. The Moroccan Music scene is vast and growing along with it’s new pop up festivals and summer venues. From 22-30 May 2015, the ancient city of Fes will host the 21st edition of its world famous Sacred Music Festival. The origins of Fes lie in the 8th century by Idris I, who is known for bringing the religion of Islam from Arabia in the East, to Morocco. Fes’ spiritual credentials were boosted by the establishment of the al-Qarawiyyin (or al-Karaouine) University, mosque and madrasa (religious school). It became one of the spiritual and educational centers of the Muslim world and remains today the longest-standing university in the world. Fes‘ role as the spiritual hub of Morocco is underscored by its historical role as the seat of Islamic learning in the Kingdom and an openness towards other cultures and religions. These factors make it the perfect location for two of Morocco’s most well-known festivals: the Fes Festival of Sufi Culture (18-25 April 2015) and the Fes Festival of World Sacred Music (22-30 May 2015). (Note: This year’s Sacred Music Festival is being held a few weeks early to avoid a clash with the Holy month of Ramadan. It is normally held in June). This year’s 21st edition of the Sacred Music Festival has as its theme ‘Fes: An African Reflection.’ The aim is to connect Fes to its broader African and Islamic spiritual heritage. In addition to the opportunity to see Sufi musicians and practioners from across the Islamic world, the Festival will musicians and artists of other spiritual traditions in a range of impressive indoor and outdoor venues. The program boasts a selection of artists which is much broader than the title would suggest – audiences will be treated to Indian, Persian, Scottish and American artists as well as a great number of North and West African musical and spiritual performances. A particular highlight will be the opening night (Friday 22 May), an event entitled “Fes in search of Africa”, which will feature some world class Moroccan and West African musicians including Driss al Maloumi (Oud), Ballaké Sissoko (Kora) and Chérifa (Tamazight song from Morocco’s Middle Atlas region) as well as artists from South Africa, Egypt, Burkina Fasso, Senegal, Mauritania, Mali, French Guyana and more. Afternoon concerts are held in the garden of the Batha Museum. These include a tribute to the great Sufi master, Rumi , in the Persian Kurdish tradition by the Payiz Ensemble of Iraq on Saturday 23 May and the fabulous Julie Fowlis of Scotland, who sings haunting melodies in her native Scots Gaelic language on the Sunday. Monday will see an unusual and inspirational collaboration between Malian Ballaké Sissoko on kora and Debashish Battacharya on Indian slide guitar. The larger evening concerts are held at Bab al Makina, an open-air parade ground near the Royal Palace. Saturday night will see a meeting between the bagpipes of Brittany, France and the folk music of Tissa, in Morocco’s northern Rif mountains. 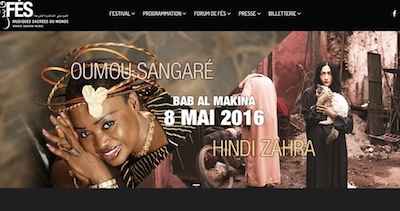 On Sunday, Malian diva Oumou Sangare and Tiken Jah Fakoly, master of African reggae from Ivory Coast will celebrate the festival’s African theme in their joint concert. Monday night (25 May) sees the first of the Night in the Media events, with Eduardo Ramos of Portugal exploring the rich cultural tapestry of Arabic, Sephardic Jewish and Andalusian music across the Iberian Peninsula and North Africa. Fans of Cuban music are in for a double treat! On Monday evening Cuban pianist and musical innovator Omar Sosa returns once again to Morocco for the premier of Marassam with Tamango (urban tap dance, USA & French Guyana), Rodrigo (percussion, Cuba) and Jean de Boysson (visuals, France). The following afternoon’s concert features Roberto Fonseca and one of Mali’s latest musical exports to global stages, Fatoumata Diawara. The two are bound to create an explosive and colorful collaboration! The concerts of Night in the Media II on Tuesday 26th at Dar Adiyel will feature artists from China and Azerbaijan, while elsewhere on the same evening, Tunisian singer Sonia Mbarek will present the premiere of her work based on Sufi poetry, Wajd. 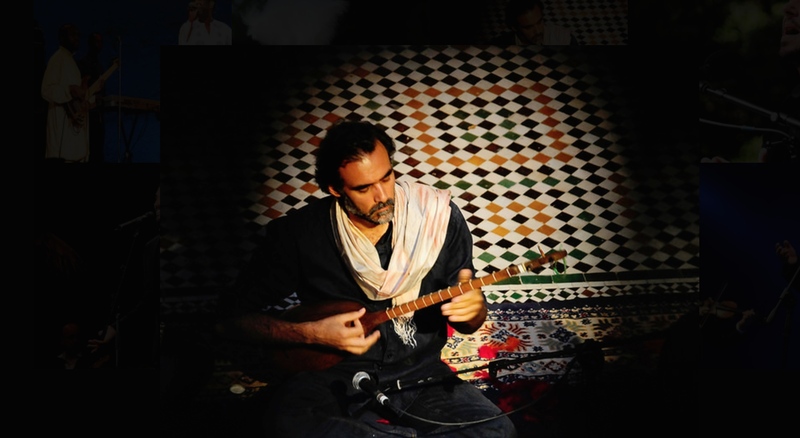 The Tuesday evening Batha Museum concert will explore the common roots of Andalusian music and Flamenco, featuring Benjamin Bouzaglou, star of the modern Arabo-Jewish Andalusian music scene. Night in the Medina III on Wednesday night features the epic Hilal story from the Poets of Upper Egypt, as described by Leo Africanus, 16th century explorer of North Africa. His history is intimately connected to that of the city of Fes: he came to Fes from his native al Andalus (modern-day Spain) at the time of the Spanish Inquisition and expulsion of Muslims and Jews. He went on to study at the University of Al Karaouine before beginning an illustrious diplomatic and travelling career, during which he documented the geography of Africa. Other Wednesday night events feature artists from Tamil Nadu, India as well as Sardinian and Corsican representatives of Mediterranean traditions. Thursday’s program features elements as diverse as flamenco, Moroccan Arabic musical traditions and the big attraction at Bab Makina – The Temptations with Dennis Edwards, presenting their own style of Rhythm and Blues to a whole new audience. All of Friday’s events draw on North African and Spain’s Andalusian heritage, including music from Algeria and another opportunity to see flamenco traditions. The evening concert is a grand spectacle of Arabo-Andalusian tradition featuring many of the Festival’s North African artists. Saturday’s schedule showcases Syrian Muwashshah traditions of Arabic poetry and music; gospel with an African touch, and the final concert with Hussain Al Jasmi of the United Arab Emirates. As the diverse program suggests, the Fes Sacred Music Festival takes a very broad and inclusive view of the sacred and of the importance of indigenous and non-tangible elements of global heritage. There is surely something to satisfy many musical and artistic interests, but also plenty of opportunity to discover lesser-known musicians and artistic genres. On a practical note, Fes gets very busy during this Festival. Visitors are advised to book accommodation early. Tickets are not yet available online but will be soon and can be purchased for individual events or for the Festival as a whole. Seating is not allocated, so arrive at venues early to avoid disappointment. Some venues are more comfortable than others and some are outside, so dress appropriately and bring something to sit on! There is no afternoon concert on the Wednesday. This is a great time to relax in the Fes medina or take an excursion out of town to nearby Meknes or Volubilis. 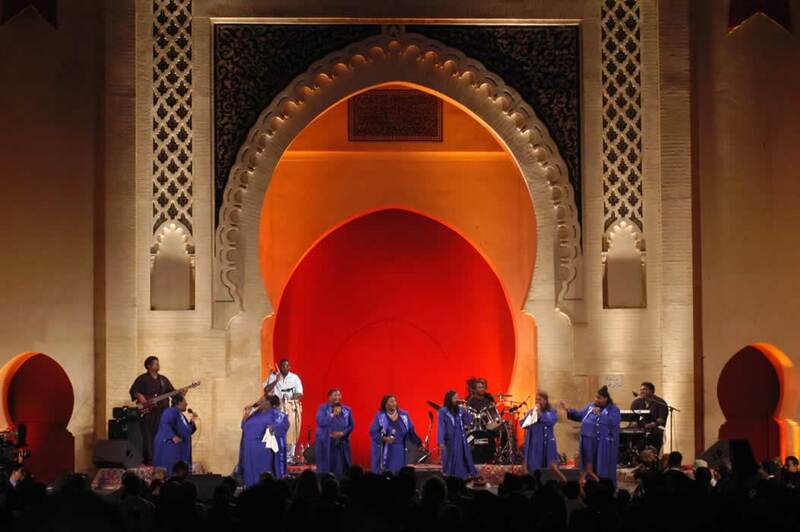 Fes is an impressive city in any season, but with the fabulous line up for 2015, a trip to the 21st Fes Sacred Music Festival is an opportunity not to be missed! 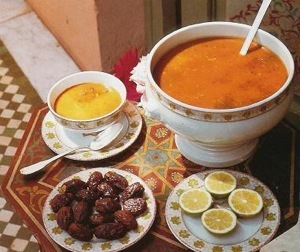 Celebration is an important aspect of Moroccan culture. Morocco is an exciting and entertaining country that lays claim to cultural, historical and religious holidays and festivals. At any given point of the year there is a Moroccan city or Berber community hosting glorious festivities. Moroccan celebrations can last anywhere from a few days up to two weeks. There are hundreds of local festivals and mouassems in Morocco. The dates when Morocco Festivals and moussems are someimes decided by religious authorites consulting the moon so dates oftheseevents are sometimes not announced very far ahead . Here are some of the more well known ones with exact dates in 2013, where available. Departing from the Avenue de la Menara behind the Sofitel Hotel, the Marrakech International Marathon covers a distance of 42.195 kms (or 21.097 kms for half-marathon) the route winds its way through some of the city’s most picturesque attractions. This beautiful spectacle takes place in Tafraoute where the trees are in full blossom for only a short time and whose colours greatly admired. The festival includes singing, dancing and other performances by the locals. performed on the streets as well. The Sand Marathon is an incredibly gruelling marathon that covers 150 miles and lasts for 11 days. 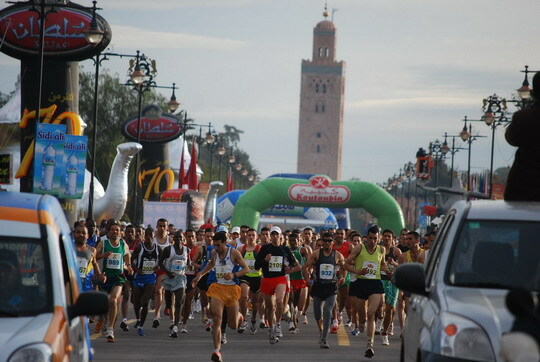 The marathon takes place in Ouarzazate, usually towards the beginning of April. 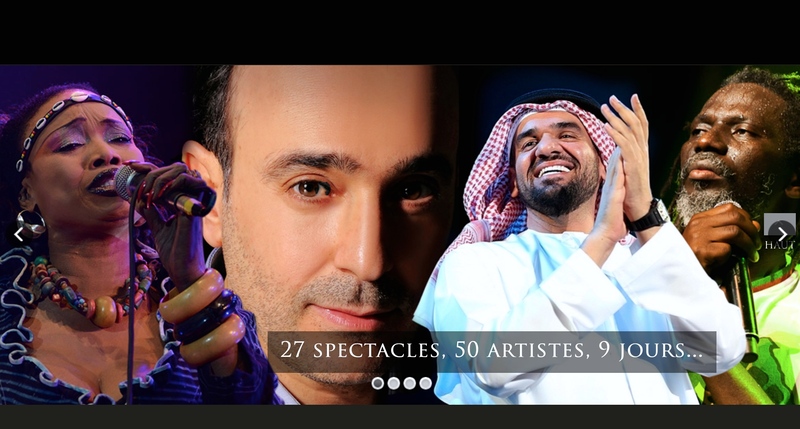 The Mawazine Festival 24 May – 1 June 2013. This modern festival takes place in the city of Rabat and has several artists performing concerts that range from top international performers to local artists, past performing stars include Elton John and Sting. Also on offer are art exhibitions and plenty of street entertainers to keep the huge crowds entertained. Marrakech Grand Prix . 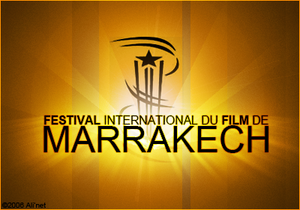 This event has been revived and takes place in Marrakech 13-15 April 2013. The Desert music Festival offers an outstanding selection of music genres that ranges from traditional Moroccan music to music from international musicians from around the world. 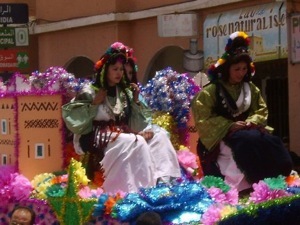 The event takes place annually in Errachidia. Festival of the Roses in the Dades Valley in mid May, a small oasis town called Kelaa-des-Mgouna is home to Morocco’s largest rose water distillery plant. The entire town is fragrant and the spectacular harvest in May is celebrated with song and dance. Fes Sacred Music Festival Saturday, 7 – 15 June 2013. 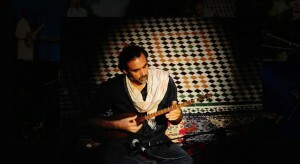 The festival offers a wide range of traditional music performed by both Moroccan musicians and those from around the world. Under the theme of “Fes: Reflections of Andalusia, the Fes Festival of World Sacred Music” is one of the premier events presented by the Spirit of Fes Foundation. The stated goal of the Festival is to harness the power of the arts and spirituality to promote human and social development, and the relationships between peoples and varying cultures. 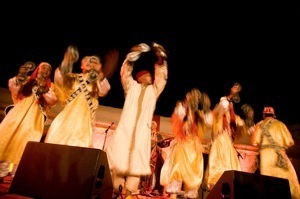 Essaouira Gnawa and World Music Festival ,Essaouira 20-23 June 2013. This music festival based on the traditions of Gnawa music has grown to include musicians from all over the world. This successful annual festival has been around for a decade and venues are dotted all around the picturesque town of Essaouira. The origins Gnawa music lie in a unique mixture of Berber, African and Arabic songs, religious rites and dance and was originally the music of African slaves. The festival features traditional Berber music, singing dancing, story tellers and entertainers and takes place in the vibrant and bustling city of Marrakech. A full stage showof different regional tribal dancing expertly chereographed led by Maawalems takes place in the floodlit Badi Palace with other concerts and peformances taking place in other locations in the city. This unique event is steeped in tradition and takes place in the village of Imichil close to Marrakech. The event provides local Berbers the opportunity to meet and agree to marry, with everyone wearing traditional dress along with plenty of music and dancing. Exact date for 2013 not yet announced. 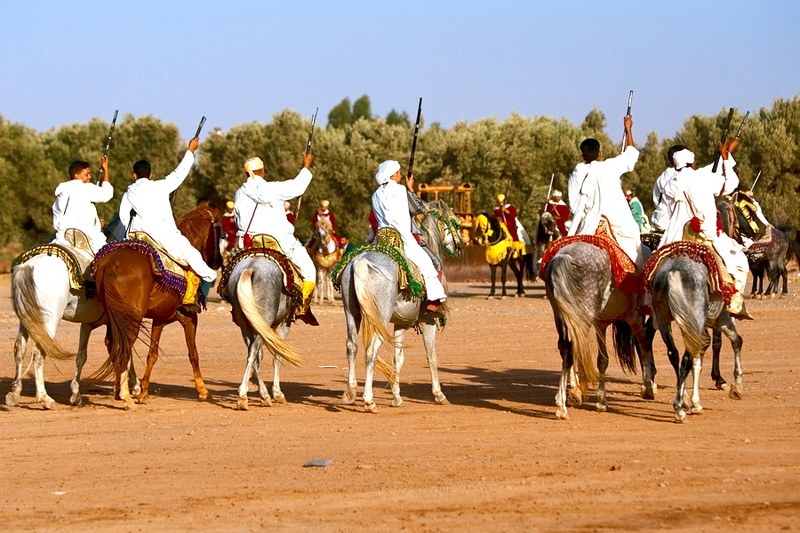 The Festival of Fantasia or Tbourida involves traditionally dressed berber riders and their mounts charging with flintlocks which they fire with a thunderous roar at the end of the charge. It takes place in Meknes usually towards the beginning of the month, and offers participants the chance to show off their horses, riding ability and timing. Imilchil is located high up in the lake plateau of the Middle Atlas Mountains inMorocco. In this quaint village you will find primarily Berber tribal clans who have a strong sense of culture and tradition that has been preserved for decades. The Imilchil Marriage Festival is the prime attraction of this village and takes place annually in September. Each September, the surrounding tribes, Aït Sokham and AïtBouguemmaz celebrate the Imilchil Marriage Festival, held in Souk Aam and Agdoud N’Oulmghenni. This festival, also known as September Romance, features the Aït Yaazza culture of an annual collective marriage where women search and choose their husband. 2-3 October El Jadida Horse Show. This is major international event including horse jumping,dressage and fantasia. The Tissa Horse Festival is held near Fes and provides the opportunity for hundreds of riders to compete against each other and show off their beautiful mounts and skills as horsemen. Erfoud Date Festival Late September/ early October. This is a traditional festival gathering, of nomadic tribal members who come together in celebration of their culture and religion. The event takes place towards the end of November or beginning of December in the town of Tan Tan, to the south of Morocco. During this annual festival, the Prophet Abraham is honoured with the sacrifice of a ram, goat or cow. 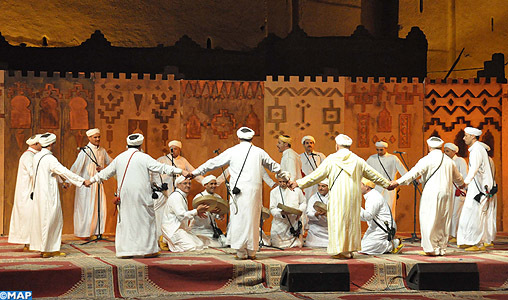 he Fes Festival of World Sacred Music in Morocco is 10-day celebration held in mid-summer (late May or early June) that takes place in the imperial city of Fes. The festival was founded in 1994 by the Moroccan scholar and philanthropist Faouzi Skaliand was created to showcase major musical traditions of sacred, spiritual music and world music. The current Artistic Director is Cherif Khaznadar, a pioneer of world music and one of the most influential Artistic Directors on the scene. Each year the festival celebrates artists from Muslim, Jewish, Christian, Hindu and other faiths to perform together in a spirit of mutual respect and collaboration. Imilchil is located high up in the lake plateau of the Middle Atlas Mountains in Morocco. In this quaint village you will find primarily Berber tribal clans who have a strong sense of culture and tradition that has been preserved for decades. The Imilchil Marriage Festival is the prime attraction of this village and takes place annually in September. Each September, the surrounding tribes, Aït Sokham and Aït Bouguemmaz celebrate the Imilchil Marriage Festival, held in Souk Aam and Agdoud N’Oulmghenni. This festival, also known as September Romance, features the Aït Yaazza culture of an annual collective marriage where women search and choose their husband. An 8-day celebration of Sufi spirituality, performance, poetry and workshop. The Sufi Cultural Festival is an 8-day celebration that takes place each April within the imperial city of Fes to honor Sufi music and spirituality. The Festival brings together religious leaders in Sufism and artists from around the world. Visitors come to enjoy ritual performances complemented by morning poetry readings, films and oriental art. The Sufi Festival which took place for its second time in 2008 featured a number of “samaa” evenings- nights filled with chanting and dance- as well as meetings and workshops; all centred around the theme “Sufism and human development”. Abd Al Malik Born in Paris on the March 14th 1975, and originally from the Congo, Malik lived for a short time in Brazzaville as a young boy. He returned to France in 1981 and grew up in Strasbourg. When his parents divorced, he became involved with gangs and later with religious extremist groups. He went on to found the N.A.P band, then discovered Sufism and became a peace advocate. He released his first solo album, “Le Face à face des cœurs” in 2004 and the second, “Gibraltar”, two years later.